This photo shows the difference between a Standard Weight and a Husky Weight Die Stuck Signet. The Husky is one third heavier than our standard weight and is available on all of our Die Struck Signets.  A Die Struck Husky Signet is an impressive ring and, with the added thickness and weight, it is perfect for any type of Hand Engraving or Customization.